There are helpful backyard birds that are fun to watch or... "Oh my, look at the mess those birds have done to my row of seedlings!" Birds never go out of fashion. If they go... we're goners. But sometimes a little control is needed on backyard birds. If so, click: Bird Pest Control. Otherwise let's look at the rewards of having helpful garden birds. By attracting wild birds into your garden with bird baths, bird houses, and flowering vegetation, they will eat many times their own weight in insects as well as give you sensory delight. In spring and summer, birds are hungry... and so are their young. They eat in a way that would give us indigestion. They're mainly after protein so they love your unloved bugs, such as aphids, caterpillars, grubs, grasshoppers and beetles. 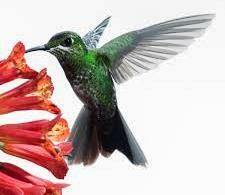 There are many helpful birds and each country of course, has its own native wild birds. There are comprehensive resources available if you want to study your local birds, but suffice to say, your bird garden will be made up of both native and introduced birds that have adapted to the local conditions. 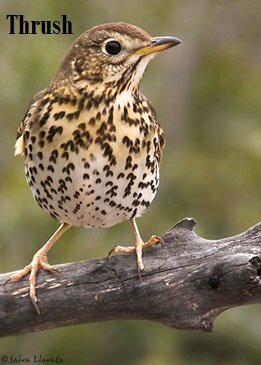 Are these backyard birds in your garden? 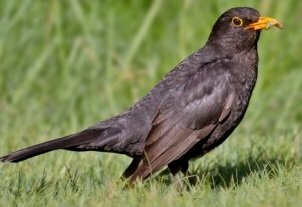 Blackbirds: They will trash your garden top layers looking for insects, though they're not such helpful birds when berries ripen. They have a habit of taking a bite here and a bite there; cutting a swathe through your strawberry patch, watch out! Bluebirds: If you were a grasshopper, even at the other end of the garden, you're a goner if a bluebird with its sharp eyes or a crow arrives. Hummingbirds: Native to North and South America, catch their prey as they hover, such as fruit flies and gnats and also pick aphids of leaves. They eat large quantities of nectar which makes them useful pollinators. Beneficial hummingbirds are delightful backyard birds to watch — they are the only birds that can fly backwards — handy stuff. 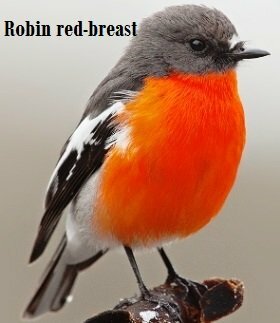 Robins: Some species are classed from the Thrush family which have a varied diet and love tasty caterpillars, grubs and winged insects. Sparrows: Common as, but you must admit are still cute. Busy little sparrows are more seed eaters but will find insects amongst your vegetables, flower beds and bushes. Starlings: Noisy and industrious, there are many species, native to South and East Asia. The Common Mynah is one of the most infamous. These handsome birds from India are now worldwide and can reach plague proportions in the wrong places... such as demolishing leftovers on cafe tables! Nevertheless, in your garden they will even search the underside of vegetable leaves to get at tasty grubs. The native mynahs in other countries are also helpful backyard birds, such as the Noisy Mynah in Australia, but they usually lose out to the more aggressive species. 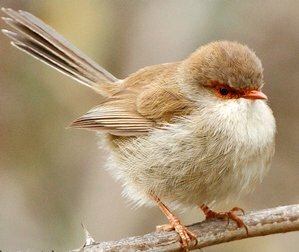 Wrens: Prolific insect eaters and as they often have half a dozen chicks to feed, wrens are busy little feeders indeed. Of course, backyard birds may drive you mad sometimes, but their ability to make you stop and enjoy their song, their habits and antics is worth putting up with a few shredded tomatoes... sometimes. 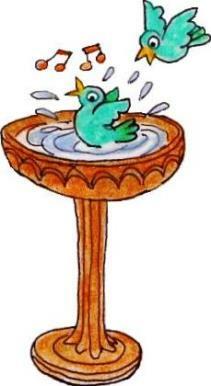 Water for backyard birds: If you want guaranteed hours of enjoyment watching wild birds in your garden, buy a birdbath. Solar powered fountain bird baths give the added pleasure of gentle trickling water using the sun's energy. Attracting birds is easy with splashing or trickling water and a fountain bird bath keeps the water clean of slime build-up. Watch the swallows come to the water, as well as keeping your pest insect population down. 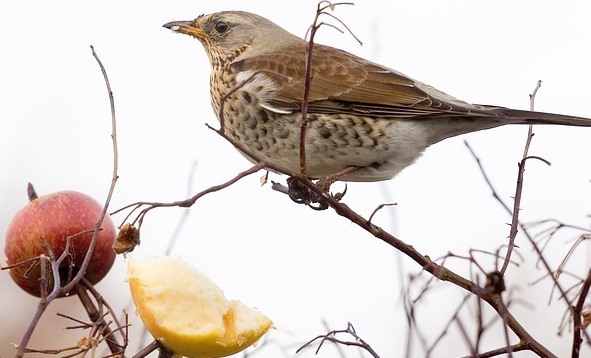 Feeding garden birds: Next in line to encourage birds is to supply extra food. Wild bird seed is available even in supermarkets. 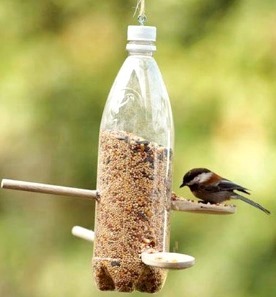 You can make your own bird feeder, such as a hanging cut down soda bottle or coconut shell. Suet can be bought and hung up in netting or put on a birdfeed table. If cats or snakes aren't around, scatter food on the ground — such a nice way to use your left-over bread. Homes for wild birds: How about going the extra mile and providing a bird house for your backyard birds? 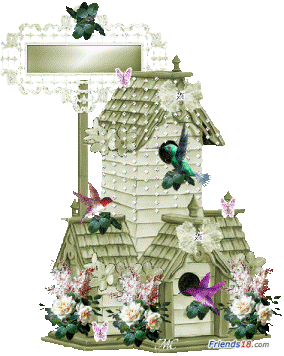 With the many different bird house patterns available, you can attract wild birds that are scarce in your area, as long as you provide just the right design for them. Bluebirds for example do not like a large front door that welcomes intruders in, such as starlings, so the entrance has to be small enough to stop them.